Patent US8157285B2 - Patent for the special braking device on the Storm Snowboard. Patent US8083251B2 - Patent for the board with customized, curved edges. Patent US8286989B2 - Patent for a footbrake conversion kit for snowboards. Here’s your chance to own a piece of snowboarding history! This board was not invented for today's two million hard-core snowboarders, it was created for the 200 million people that do not own a snowboard, but would if it was easy and fun to ride. Fact: Eight out of every ten people who try snowboarding never do it again. They say it is too hard to learn, too painful, and not very much fun. Randall Wasserman, inventor of The Next Generation Snowboard, agreed after attempting to snowboard on his own. He recognized that the traditional snowboard, as it is presently designed, is counter-intuitive to the human body and difficult to learn how to ride. 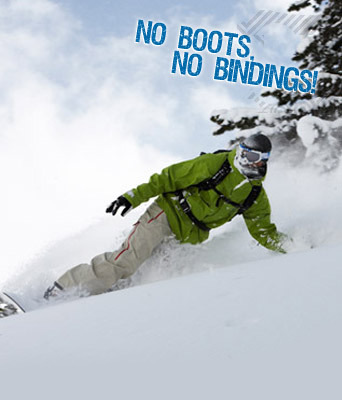 Randall knew there had to be an easier, more enjoyable way to snowboard, and he was right! He invented and patented The Next Generation Snowboard: the snowboard that will change everything. Randall realized that to be successful, the next generation snowboard needed to be easier to ride, fun to use, and simple to control. The Next Generation Snowboard does that with a retractable footbrake that allows the user to slow down without turning for a more intuitive boarding experience, and a revolutionary shaped bottom that enables the user to turn the board effortlessly. Simply put, it is easy, fun, and riders of all ages love it! Randall is looking to sell or license the rights to his patents. If you are interested, please contact Randall at the number below.